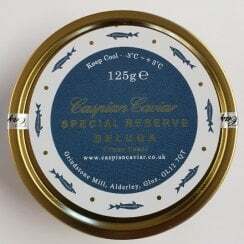 Large egged hybrid Beluga Caviar from our favourite farm in Italy. 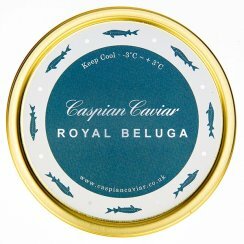 We currently offer two different grades of Beluga caviar. 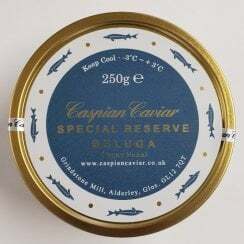 The Special Reserve Beluga is an exceptional example of pure Huso Huso, with the characteristic large grey eggs and buttery flavour. The Royal Beluga caviar comes from a hybrid sturgeon (Huso/Bae) and offers a well priced alternative, with large dark grey eggs and a great flavour. 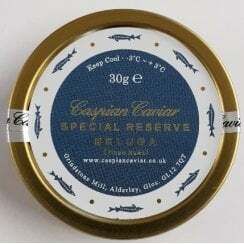 It has been one of our best selling caviars since we introduced it five years ago.